As the largest economy in the Southeast Asia region, Indonesia has a total GDP of US$888 million with target GDP growth set at 5.2%. The archipelago was ranked 91th out of 189 countries in the Ease of Doing Business 2017 report. Indonesia certainly draws attention to many foreigners looking to establish their businesses in the country. Not forget to mention, Indonesia leading consumer-related market opportunities. However, if asked about what industries that investors should avoid, we will advise you with none of it. As the saying goes, there is no such thing as bad investment, but if there is a bad marketing, then the investment can deem to be a failure. Therefore, there are not specific industries that new entrepreneurs should not invest when the look into Indonesia. However, the setbacks that they will want to look out for are the external factors that has a high possibility to take place in Indonesia, which we will discuss below. Basically, doing business in Indonesia is not as easy as it sounds, especially setting up the foundation of the business. Here are few of these challenges. While all foreign entrepreneurs may be limited by the Indonesian laws and regulations in terms of being their own business owner or even owning businesses in the country, it is still doable and able. 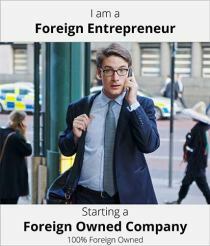 Strategy-wise, a foreigner may also invest in companies they want to be part of. The Indonesian government allows foreigners to invest in certain business sectors depending on their categorisation under the Indonesian Negative Investment List (DNI). The DNI is listed into several categories from Closed to Investments, Reserved for Small and Medium Enterprises (SME), Through Partnership with SMEs, Limited Foreign Capital Ownership, Defined Location, Required a Special License, 100% Domestic Capital, and Foreign Capital Ownership. This means, all foreign investors need to pay attention to the DNI list, as the indonesian authority has the tendency to change it every few years. In order to successfully register a business in Indonesia, you have to get past through several government regulations and clearances, and this can be more than any other countries that you will have been to. Prior to that, in additionally to the regulations, you will have to apply for a principal license from the Indonesia Investment Coordinating Board (BKPM). There are several documents required to apply for this license including proof of taxpayer number, a certificate of domicile, clearance from the Ministry of Law and Human Rights and some others depending on the industry you are investing into. Just like we mentioned above, you have to keep in mind that government is likely to renew or modify the Indonesian regulations regularly than the norm.